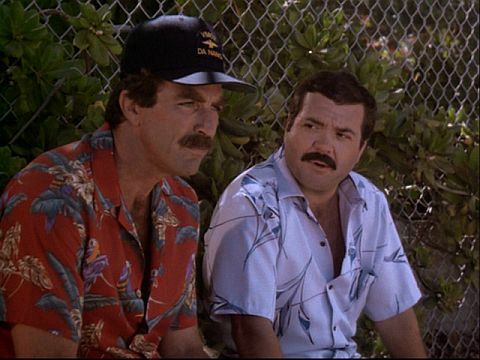 Thomas (Tom Selleck) is having a rough time of it as Mac’s Back opens. Written by Bellisario, with an airdate of 11 October, 1984, this is an episode that is almost a direct continuation of the events from the previous episode, something that didn’t happen a lot in episodic television during the 80s, but I guess after four full seasons, you’ve got a bit of a history and an audience. Thomas is dealing with the loss of Diane Dupres (Sharon Stone) in the previous episode, but not just her, the weight of all his losses, like his wife Michelle (Marta DuBois), his father (Robert Pine),everyone who has ever relied on him,and died because of it, including his friend Mac (Jeff MacKay). Wallowing in countless beers, he’s stunned when he sees someone who can’t be… Mac! 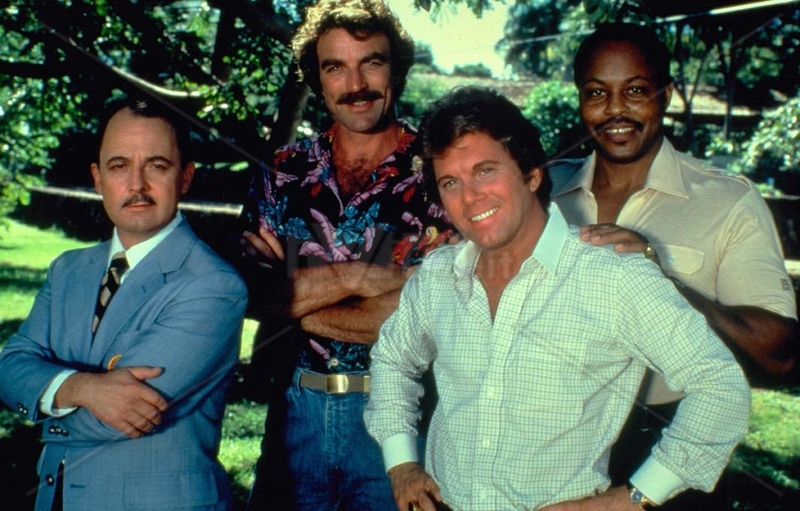 Of course, Higgins (John Hillerman) doesn’t believe him, and has even consulted with Doc Ibold (Glenn Cannon) about committing Magnum to a hospital. But Thomas is obsessed with finding his friend now, who seems to be travelling under a variety of names, including Lt. Cmdr. Hiller, Father Jim, and Neville. But no one believes him. When he finally corners Mac/Neville, he says he’s working for the NIA and needs Thomas’ help. Which he gives, only to be made to look like a fool. And lurking behind the scenes is Colonel Buck Greene (Lance LeGault)- What’s really going on here? And is his friend really back from the dead? A solid episode that takes us from an emotionally worn and depressed place to some well-earned laughs. The Legacy of Garwood Huddle is a bit of a mixed bag, some nice moments, one great in-joke, and a story that wasn’t as engaging as the previous episode. It was written by Richard Yalem, and had an airdate of 18 October, 1984. Garwood Huddle (Pat Hingle) was a very successful bank robber during the 40s, and has a connection to Higgins as well as some buried loot. When he learns that his grandson has been kidnapped, he promptly escapes from prison, and with Higgins’ help, settles into the estate, using it as a base of operations. The two persuade Thomas to help out, and Magnum starts to dig into the case. He talks to Garwood’s ex-daughter-in-law, Frannie (Belinda Montgomery) and her new fellow, Walt (John Ratzenberger), who don’t provide him with much in the way of clues, so he and Huddle have to work together, and try to dig up his buried stash of money… only to find it gone. There are a couple of great moments in this episode, the first is an old 40s newsreel about Huddle’s exploits, narrated by Phil Hartman. The other is a rather off-the-cuff remark made about one of Walt’s evenings out, spending time with his friend Norm.